Editor’s note: soon this warm, brown October will become a new data point in the Fairbanks weather record books, and we’ll be able to start on-snow training for the 2014 Sonot Kkaazoot. In the meantime, this book report by Robert Hannon reminds us that training for a long distance event requires learning to deal with whatever Mother Nature throws at us. When I fell in with the ski training group known as the SCUM (Susan’s Class of Uncoachable Men, the current Sonot organizers), I naturally assumed there would be skiing and training. I have not been disappointed here. When nature provides snow, SCUM can pretty much be found out on it most hours of the day or night, even though we only meet officially once a week. Indeed, even in the protracted snow drought this fall SCUM were still out on roller skis, ski walking or running along trails in lieu of skiing. Also, Mother SCUM periodically emails us with links to training videos from Sweden and exhorts us to remember our core exercises. What I wasn’t prepared for was a reading assignment. Now, I’m as literate as the next person. I glance at microwave instructions on frozen meal cartons, scan the urgent stickers on junk mail, and peer at road construction notices when driving. But you could have knocked me over with a heat gun set on low when Susan handed me a book this summer and told me it would help my skiing. I didn’t get what she meant at first. The book was Bill McKibben’s Long Distance. McKibben’s name might be familiar to some through his efforts to document the steady rise of global temperatures and the reasons for and consequences of that rise. Long Distance is a more personal book. Like Dante before him, McKibben finds himself a bit lost in mid-life. He writes when he turned 38 he felt the limitations of age edging closer. Being a XC skier, he decided to give himself over for a whole year to train with single-minded intention and see where that took him. He secured the services of a professional coach and diligently followed his training plan. 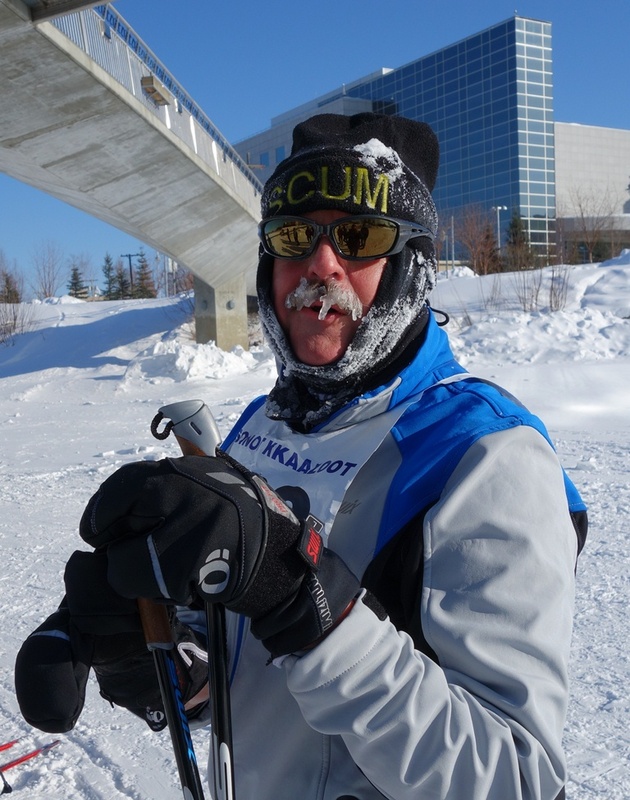 Long Distance then is our ticket to follow the competent amateur McKibben as he works out, races and explores the world of professional Nordic skiing. He’s a wonderful guide. His style is funny, self-effacing but full of interesting bits of information. He also paints vivid scenes. One example: early in the book McKibben confronts a dramatic shift in weather on race day. Panicked by the bewildering alchemy of waxing, he scurries from trailer to trailer seeking advice from team crews who view him and his questions with darkest suspicion and mumble vague suggestions. You might as well ask an experienced Alaskan angler where the best place to fish lies. Along the way, McKibben also puts XC skiing in the larger landscape of American professional sports coverage and why even during Winter Olympics our sport of choice barely rises into broadcasters’ awareness. We hear from Swix and Fischer salespeople about the trials of marketing Nordic skiing in the U.S. Not content to leave it at that, McKibben compares our national indifference with the near mania Scandinavians feel for all things Nordic. It is enough to make you weep. We also meet top skiers and coaches and get a sense of what it takes mentally as well as physically to excel as an athlete. All these points have been covered before by other writers on other sports. Indeed, many of the observations could be found in the Nordic Skier newsletter or on the Fasterskier.com website. What elevates Long Distance above other efforts to document the “inside world” of sports is McKibben’s own story, more specifically his relationship to his father. Half-way through his training year McKibben learns his relatively young father has been diagnosed with terminal brain cancer. Thus, Long Distance becomes an “inside look” at an American family as it strives to make sense and cope with disease and death. To his credit, McKibben handles these scenes without heavy sentimentality. Applying the same eye for detail he gives to waxing and training he recounts the physical, chemical and radiation therapies his father undergoes as he retreats step by step to the end. We also see the toll this medical slog takes on the family. In this way, McKibben earns the right to draw some revealing parallels between his father’s ordeal and what McKibben has learned about distance ski training. What might be cheap clichés about his father running the good race and endurance, become genuine insights into the relationship between ordeal and character in an average American life. Anyway, I handed back Susan’s copy of Long Distance a little wiser and happy in the knowledge that my own copy was on the way from Amazon. I know I’ll be reading it again. It isn’t just the selective memory of skiers and dog mushers, this is an unusually warm October. 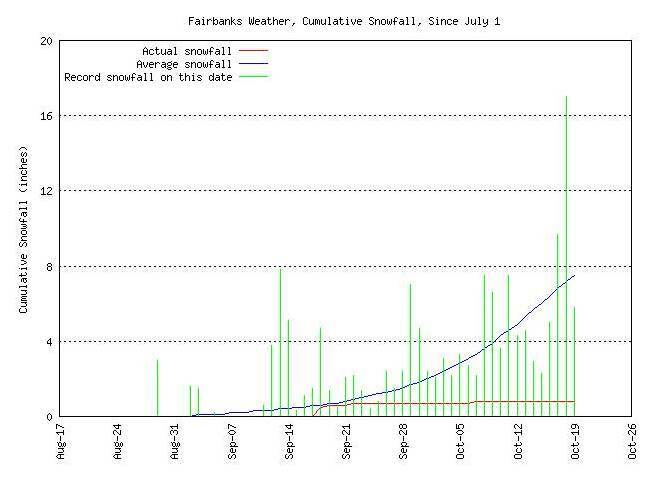 More importantly, the cumulative snowfall is well below the long-term averages for Fairbanks International Airport. On “average” we’d have almost 6 inches of snow on the ground by 19 October, and thanks to our well-maintained and groomed trails at Birch Hill, we’d likely be skiing. At least, the lows should be dropping back below freezing so the probability of retaining any snow we might get increases. We certainly hope to be skiing by the Ski Fest to be held at Birch Hill on Saturday, November 2. We’ll be there to sign-up skiers for the Sonot Kkaazoot at the lowest possible entry fees from 1 to 4 p.m. at Birch Hill Recreation Area. 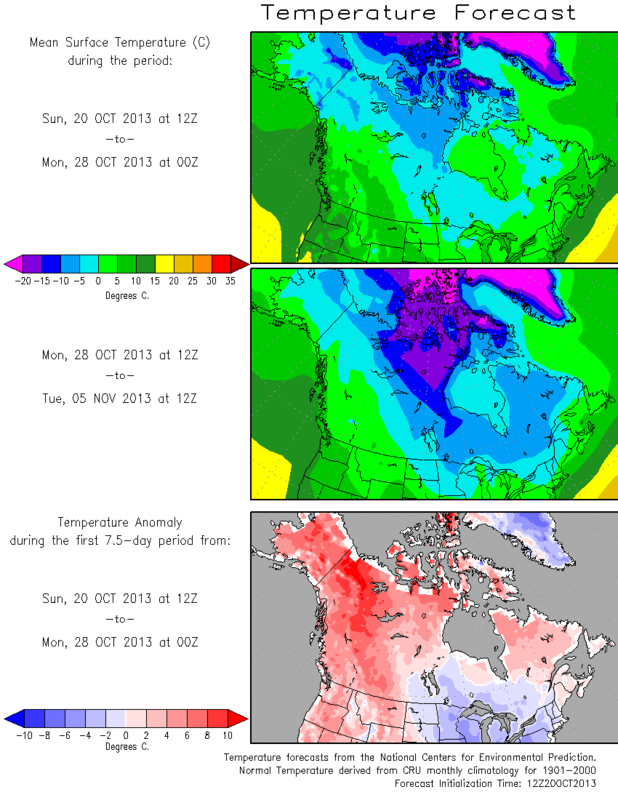 The unseasonably warm October temperatures in much of Alaska are predicted to continue at least through the end of October. Although much of the government has been closed down for since 1 October, the National Weather Service, because of the “essential” nature of their work, has been issuing weather forecasts and warnings. Sadly, for cross country skiers, the forecasts aren’t encouraging. The figure below is today’s 8 to 14 day forecast, and you can see by the intense red over interior Alaska that any precipitation we’re likely to see, probably won’t be in the solid form. Remember that the Sonot Kkaazoot will be held a week later than normal because of Arctic Winter Games, so you’ll be less behind on your on-snow Sonot Kkaazoot preparation than you might have been.